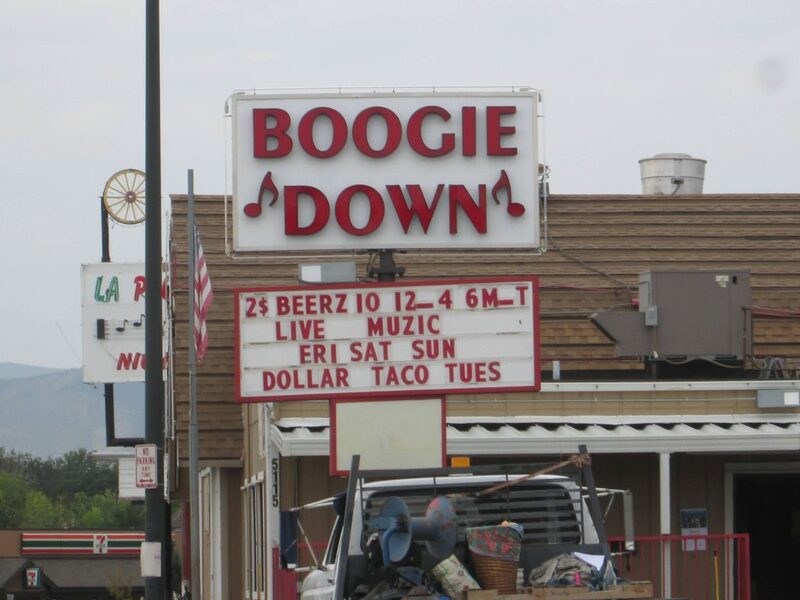 Sitting next to each other like twins, the Mar Lee and Westwood neighborhoods in West Denver are two forgotten treasures. They share Federal and Sheridan as their east/west borders, with Westwood to the north starting at Alameda, stopping at Mississippi where Mar Lee starts, ending at Jewell. 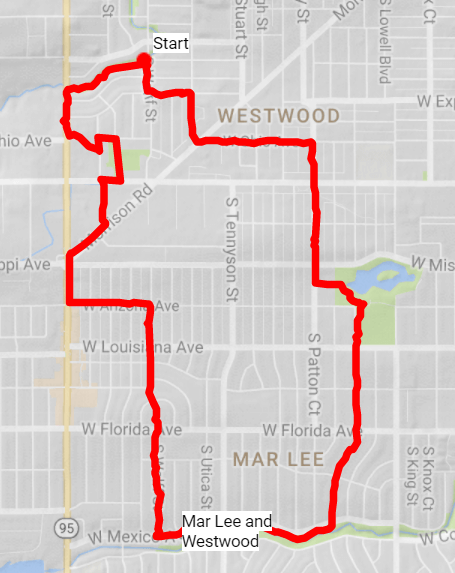 We took a 5-mile amble through these two neighborhoods, meeting kind people, walking along two gulches, and getting to know these secret areas of west Denver. Westwood has gotten more attention in the news than its southern neighbor, Mar Lee. 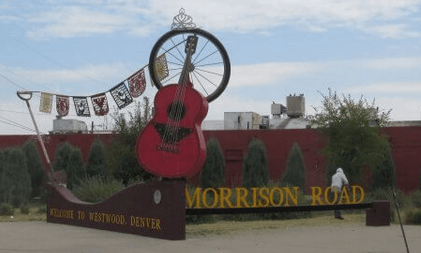 With Morrison Road running diagonally through it and home to Westwood Park, the City of Denver plans to spend almost $1 million upgrading, renovating, and beautifying the area. Westwood homes several large night clubs featuring Spanish-speaking artists, many local Mexican restaurants, and World War II housing. While walking along, we came across a yard sale. The owner had lived in her home since she was 3 (or for 63 years!) 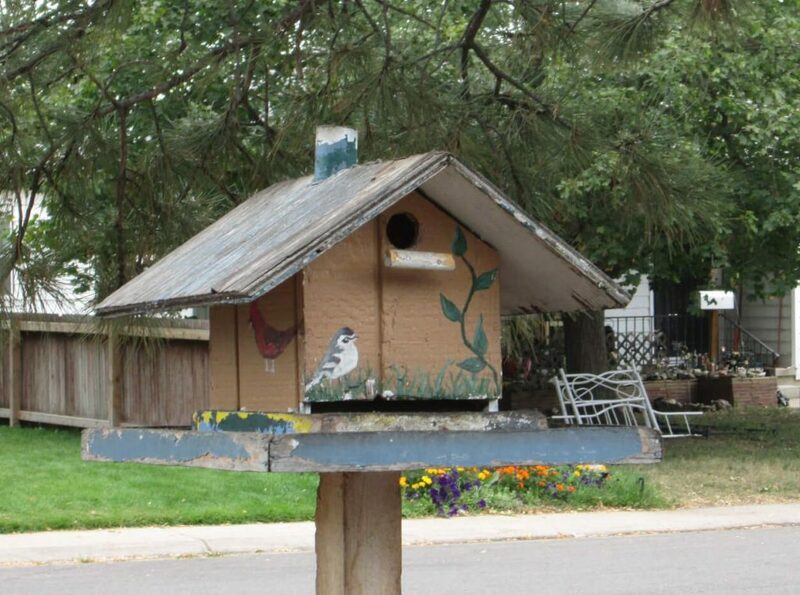 She stated that her house was the first home built in the neighborhood. She said it originally was a barrack. Considering how the neighborhood grew in response to rise of the Ordnance factory in what is now Lakewood, it’s no surprise a few barracks-turned-homes show up in Westwood. Crossing into Mar Lee over Mississippi was uneventful. Yards became a bit neater, and many of the tiny WWII homes still stand. Some not even 1000 square feet, these 1940 doll-house sized homes give way to 1960s brick split levels as we made our way toward Sanderson Gulch. Sanderson Gulch, a nice trail that leads to the Platte River, runs along the southern end of Mar Lee. 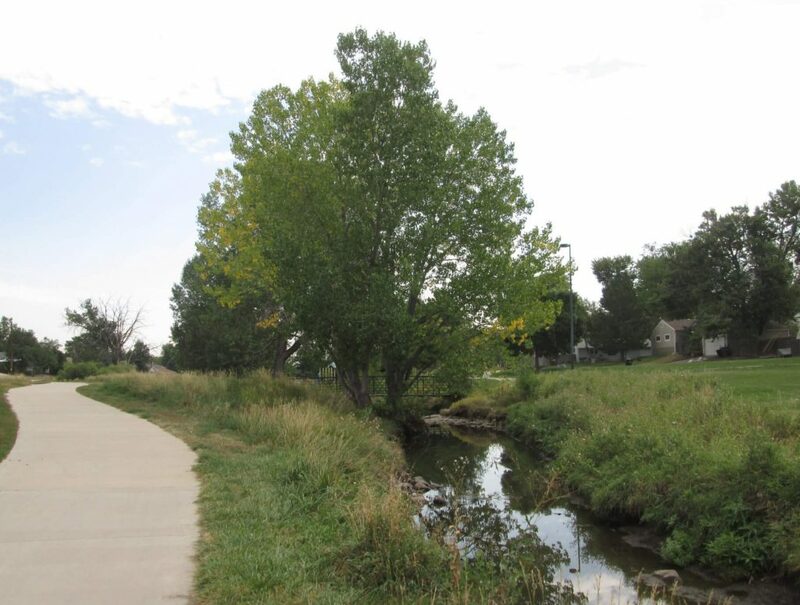 Together with the Weir Gulch in Westwood, it’s easy to make a large 5-mile loop between the two neighborhoods. We took advantage of both, hooking up through Mar Lee to Westwood via the fabulous Garfield Park. 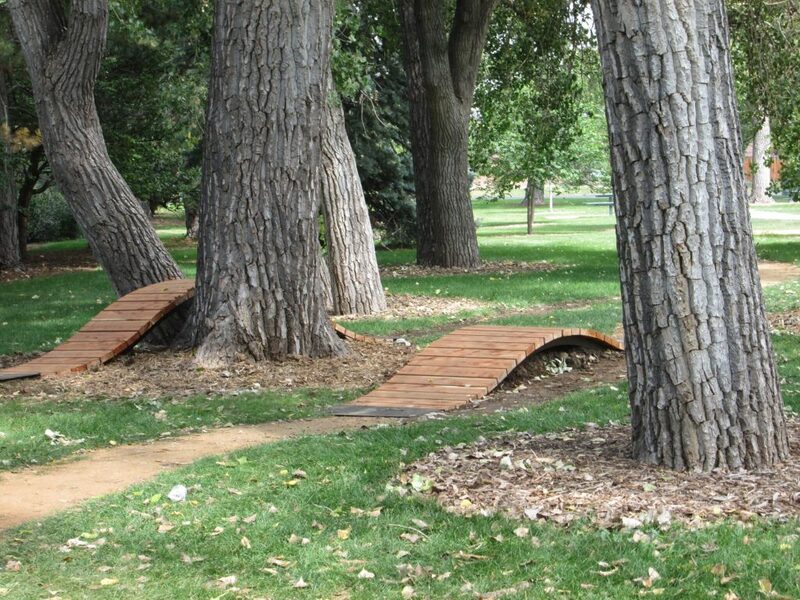 Did you know Garfield Park has a brand new single-track activity trail? We watched it being installed, and it will be opened in the next few days! Walking through Mar Lee and Westwood was a pleasant surprise. Although these neighborhoods were quickly thrown up in the 1940s with limited thought for code or longevity, they have survived the wax and wane of neighborhood growth and change. 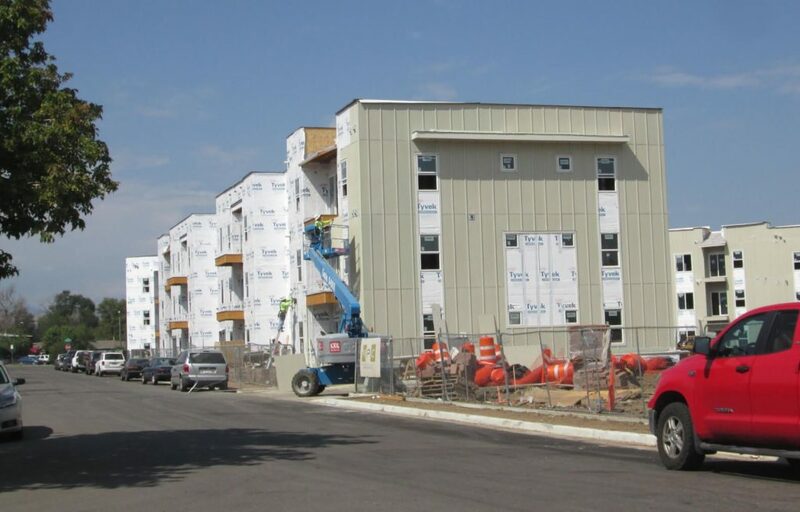 We did see a new higher density set of buildings going in, but for the most part, the neighborhood homes have stayed the same. After walking neighborhoods like Highland, Hale, and Jefferson Park, it’s nice to see things stay the same. 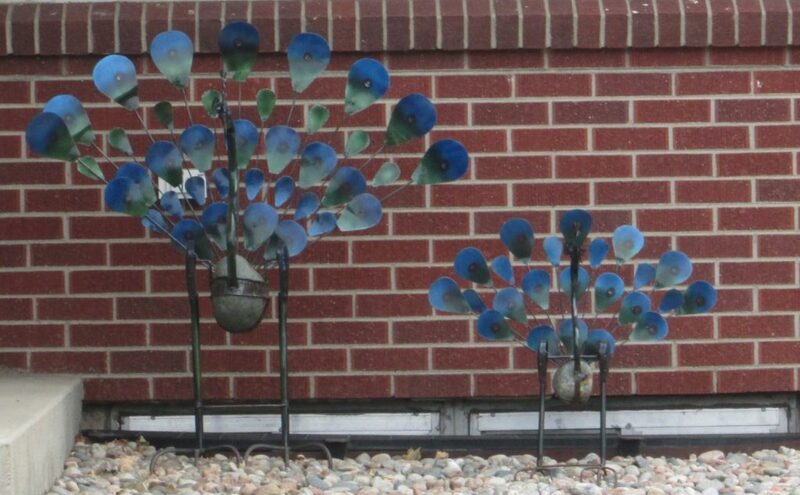 Start at 629 S Wolff St. Jump on the Weir Gulch trail on the west side of the street. Take the Gulch to Sheridan. Turn left. Turn left on Ohio. Take that to Yates. Turn left (north) on Yates for a few steps, taking a right on W Ohio St to Westwood Park. Take a right into the park, walking through the park to W Kentucky Ave. Take a right, then a left on S Yates St. At Morrison, admire the Welcome to Westwood sign, then turn left on Sheridan. Take a left on W Arizona St. Take a right on Wolff. Cross over Mississippi into Mar Lee. Continue to Mexico St.
Take a left on Mexico, and when you can, jig to the right to get on the Sanderson Gulch. Stay on the Gulch until you take a left (north) on Newport. Follow Newport to Garfield Park. There’s a nice Denver Park and Rec restroom in the park, and if you’re lucky, a man selling ice cream cones! Walk north through the park past the lake and next to the single-track bike trail. At W Mosier Place, exit the park to the left, then turn right on S Patton Ct.
Cross Mississippi back into Westwood. Continue to W Ohio Ave and take a left. Cross over Morrison, turning north on Utica St. At W Exposition Ave, take a left. Take a right on S Wolff St, returning back to the start at Weir Gulch.